Review | A Mirror of My Thoughts! Somehow I just loved this movie! Its been indeed long time since I watched a Telugu Movie devoid of hyped up movie cast full of gusting hotheaded action. And how I loved it! The current Tollywood Industry doles out umpteen releases every week almost with reverence to quantity over quality, out of which I spot rare gems like this once in six months or an year. Now, playing the spoilsport, let me unveil the plot a little. Abhiram (played by Sharwanand), a spoiled rich brat who saw the world through the glass doors, discovers a real life out of the window panes when he embarks a bike journey to get back his lady love Janaki (played by Kamlinee Mukherjee, my favorite :-)). Janaki, an orphan and a idealist who believes in playing the good samaritan dumps Abhiram, when she realizes that he couldn’t support or share her idealism or values. Abhiram takes off on his bike in pursuit of Janaki, who went on a doctor’s camp to remote areas, and thus comes in close contact with humanity. In pursuit of his ladylove, he discovers himself. By standing for friends and by fighting for what he believes, Abhiram discovers the essence of life, as the self realization dawns on him over the end of the long winding journey. Now, the story is not just about breaking and making it up by the lead couple. This movie is a celebration of life, realization, introspection and humanity. Words would sure flat to elaborate the performance of Allari Naresh as Gaali Sreenu. Gaali Sreenu, a petty thief, teams up with Abhiram in his pursuit of love and shows him the real world in the hinterlands. With a serious theme that explores the divide between the ‘Haves’ and ‘Have-nots’, this movie packs an ample punch of comic relief that cheers one up while engaging the audience in serious reflection. Abhiram discovers life, death, friendship, honor, values, humanity, and loss over the journey and finds himself as a socially responsible citizen when he meets his destination of love. I would recommend this to anyone who wants to catch a meaningful Telugu Movie that does a great job of being an entertainer. Kudos to the new director Rama Krishna for this marvelous movie. P.S. I read that this movie is inspired by ‘The Motorcycle Diaries’. I haven’t watched the original, and hence am clueless on whether this movie is a copy or an inspiration of the original. Yet, its a great movie with some natural performances to save it for keeps. A really crazy entertainer. I had such fun watching this situational comedy that paints this mad mad world in such a crazy splendor, that I couldn’t resist writing about it. Sans a glittery cast, this movie does manage to bring a smiling curve on your face. Up And Down In The Dales..
Gervase Phinn takes us through a roller coaster ride of humor, happiness, joy and concerns that’s filled in the regular life of a school inspector Mr. Phinn, which is peppered by ample dose of engaging teachers with their weirdo beliefs, inquisitive kids with their endearing innocence, and interesting colleagues armed with their share of rants. He is an expert raconteur when it comes to popping us back to our school days through the happenings in the novel, for I must say, this little work of fiction strangely seems so close to reality. In an easy going breezy fashion, Gervase Phinn transports us to the simplistic life in Yorkshire Dales, and I must admit that I enjoyed this delightful travel. Another in this year’s mega let downs! After Saawaria and Om Shanti Om, this is another movie that left me with mixed feelings. Ashutosh Gowariker’s ‘Jodhaa Akbar’ is a historical drama of epic proportions that tries to depict a delicate romance between a Mughal Emperor and a Rajput Princess . That being said, watch this for costumes, performances of lead pair, settings and background score. The music in fact has risen my expectations which couldn’t be fulfilled by watching the movie. I would have loved this movie, had I had a remote control in the theater. How I longed for it! Sadly I lived with this reality that I had to wade through mediocrity and Bollywood masala for a few moments of brilliance. Brilliance of execution in some of the scenes, like Hrithik’s taming of the wild elephant, Aish and Hrithik’s sensuous sword play, the huge crowd filling battle field scenes, court room sceneries, and the dance number when the people honor the Emperor with the Akbar tag. Yes, this movie is Hrithik and Aishwarya written all over. Aish and Hrithik look every bit regal in their attire, mastering grace, elegance and royal countenance in a sweeping flourish with ease. I just loved the way they lived up to the role in an amazing restraint. Indeed Aish and Hrithik did justice to this untold love story championed by Ashutosh Gowariker. For me, it is just another Romantic Story, a rather slow moving one at that, topped off with some real grandiose costumes, soulful numbers and the pristine old times usage of Urdu and Hindi language (I was really wondering about the meaning of some of the words 🙂 ). And Yes, the USP of this movie is that its based on the Historical facts. Let’ not get into the veracity of those claims, for that reminds me of this starting line in Mel Gibson’s ‘Brave Heart’ which says “History is written by those who have hanged heroes”. What’s often projected in those glorious history books is what those in power and control want to project. And even that is mingled with a great deal of controversy. Jaise milte nahi kisi dariya ke do kinare”.. I kept a track of every passing hour in the movie giving in to the yawn and the complaining of the inner voice, and sadly that’s not what I expected out of this. Now you may ask, why is this review full of pictures and very little words? That’s what this movie is about and that’s what I really loved, the richly detailed presence which was marred by the narrative. I would understand if people rate this a four starer based on cinematography, costumes, sheer magnitude, attention to detail for this historical romance, or visual experience. In the end, what matters to me is the sheer experience or joy of being a part of the movie, that era and that journey. Yet, Jodhaa Akbar didn’t manage to create a tug at my heart. This is the first completed book of mine after coming to Bangalore. And I realized that the credit goes to the author duo than to my wish when I gaze over the five other books that I am struggling to complete. 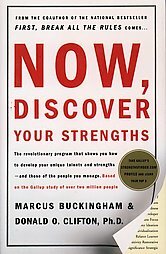 Marcus Buckingham and Donald Clifton who are associated with Gallup International Research and Education Centre came up with this Strengthfinder model which helps one to identify and appreciate their natural talents and nurture them to their strengths. Most often than not, organizations focus on Area of Improvement zones for enhancing productivity of the employees instead of goading them to capitalize on their strengths. I am sold on the concept of capturing the natural talent of a person and building upon it rather than straightening out the weakness areas. In this book, Don and Marcus talk about 34 themes which kind of capture the universe of talent in some level. After interviewing about two million people , they have devised a Strengthfinder test which throws up related statements and counts on the intuitiveness of the individual to select the choices to grade him under the top five related themes. The beauty of these themes is that they are quite diverse. They include quality of individuals (e.g. analytical) , behavior parameters (e.g. Discipline, Empathy) and personality traits (e.g. Achiever, Arranger). Though some themes are a little different from the common language usage (e.g. Input, Relator, Woo) they are bang on in identifying resonant patterns of behavior of the individual. I found it quite insightful to wade through the different themes as I could connect different people to the related talents. And the beauty of this work lies in presenting scientific analysis in simple and sensible language so that many can identify with it. I read this while waiting in queue at a seamstress place. 🙂 I would definitely recommend to take a look. The first thing that strikes about this movie is SRK and Yash Raj Films.. Honestly I expected a super romantic story with loads of good music. Must say I am delightfully surprised. King Khan delivers complete justice to this off beat de-glam role as he creates magic with his magnificent aura and charming presence. It is a special movie for many reasons and after watching the movie at the edge of my seat for a couple of times, I must admire the courage of Director Shimit Amin for coming up with a novel theme of women hockey game in this cricket frenzy India. Many fail to appreciate that Hockey is our national game and somehow it went into oblivion when the most glamorous cricket took over. I am most impressed by the fact that hockey stick sales went up by about 300% after the release of Chak De! This movie brings out beautifully that ultimately when everyone is on field, its more than just a game. Its about getting ten odd players with diverse backgrounds to unite and stand as one. Its about a team playing its heart out for the love of the game, with a hope to win against all odds and for a chance to hold on to a dream created by belief. Its about appreciating the beauty and the values that I inherent from my motherland and taking a charge to preserve, or protect its identity. It also involves how much am I taking responsibility to introspect, or change for the betterment. Shimit has done a great job of highlighting a lot of issues that come in the way of the development of sports in India, like the unethical side of media in branding Kabir Khan as a traitor, the politics, corruption and the bias with in the selection board in dealing with coach and player selection, regional fanaticism within the players and the crowd, gender discrimination in India, selfish motives of the players, lack of mental training and encouragement. We always talk about Unity in Diversity, yet we seldom acknowledge the discrimination that we show to the minority classes or the south eastern states. Whats sets this movie apart is that unique touch of Indian flavor, and well grounded realism. I loved Komal Chautala and Balbir Kaur in their well groomed roles. And it stands out as it creates hope and makes us believe that nothing is impossible when we set our hearts on it. Namumkin? Wahi To Karna Hai!